The Coral Coast includes many of Western Australia's favourite attractions. In the Coral Coast region you will find the Pinnacles at Nambung National Park, Abrolhos Islands, Kalbarri National Park, Shark Bay World Heritage Area, the dolphins at Monkey Mia and the incredible Ningaloo Reef where you can swim with the world's largest fish - the Whale Shark from Exmouth or Coral Bay. The Coral Coast is so named because of its unusual coral formations so far south. 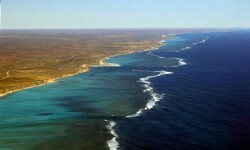 Western Australia's Coral Coast covers approximately 1270kms of coastline. This coastline stretches from Cervantes to Exmouth. Western Australia's Coral Coast has some very beautiful and bizar natural attractions ... In Cervantes, the limestone structures known as the Pinnacles rise up to five metres high. The stromatolites in Hamelin Pool at Shark Bay are formed by millions of living microbes similar to those found in 3500 year old rocks. Shell Beach is a snow white beach made up of millions of tiny shells. North of Carnarvon there are waves that are forced though sea caves before exploding out through holes in the rock which we call Blow Holes. Sites of interest in Western Australia's Coral Coast include: Ningaloo, Exmouth, Shark Bay, Indian Ocean Drive, Cervantes, Jurien, Green Head, Leeman, Dongara, Greenough, Geraldton, the Abrolhos Islands, Horrocks, Port Gregory, Carnarvon. Australian accommodation. Australian holidays accommodation guide to the best hotels, motels, lodges, family resorts, luxury accommodation, backpacker hostels and bed and breakfasts. Search by accommodation type, name. View the best holiday accommodation in Australia: comprehensive, easy to find and book. Not just last minute deals on accomodation. Whether you're single, a couple or a large extended family with a tight budget or not, we have a range of accomodation to suit your holiday needs. You will find a range of Hotels, Resorts, Serviced Apartments, Lodges, Luxury Accomodation. Find out where to stay in Australia. Book your accommodation now with eTourism Holidays for amazing savings! Australian accommodation. Australian holidays accommodation - all states, all regions.